The text on the map has been set in the Milosz font, designed by Damien Collot, the winner of the Czeslaw Miłosz International Font Competition. The competition was organised in 2011, by the ZNACZY SIĘ New Art Foundation and was co-financed by the Minister of Culture and National Heritage. The Literary Map of Krakow is a comprehensive city map, available in two language versions, which in a simple form shows the literary aspects of Krakow – its contemporary life, institutions, and historic places connected with literature. It also helps to find selected bookshops and libraries. Its authors did not want to create a database, but to incentivize people to embark on their own search – to invite them to discover literary addresses, to provide them with an outline of the history of literature in Krakow and to enhance various forms of their contacts with books. The map covers the city centre (within the range of the second ring road), as well as Kazimierz and Podgórze. The plan also features Bronowice and Nowa Huta. The latter is considered by the authors as an essential, but at the same time still not fully “discovered” place. The locations are grouped into categories, such as literary addresses, historic monuments, libraries and bookshops, literary cafés, literature in public space and Nowa Huta. The users may visit places connected with different times – ranging from the early days of printing trade to the ones in which the vibrant contemporary artistic life goes on. The map has a witty, cartoon-like design. It refers to the tradition of Polish illustrations and cover designs, and it shows characteristic figures and “Krakow types”. The map will tell us where Tadeusz Peiper used to live, where young poets and prose writers liked to meet, why a certain apartment in Karmelicka Street was once called Satan’s synagogue, and also why Gombrowicz’s swing allows you to rock back to back only. One may find out that almost each stone in Krakow has its own literary story to tell and that the oldest European bookstore operates here. We will learn what it is like to live in the city in which literature is one of the most important assets – almost a branch of industry. An important element of the map is the buy/borrow a book list. It features a selection of bookshops, second-hand bookstores and libraries on the map, which have been chosen because of their diversified assortment and library collections. 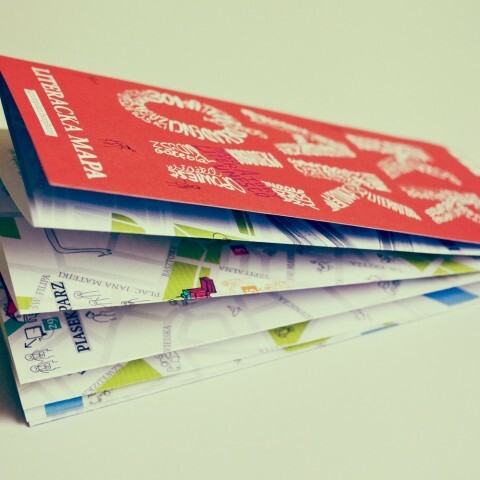 The literary map may be found at the points of the InfoKrakow tourist information points, in bookshops, libraries and at all places connected with books, including festivals and literary meetings.